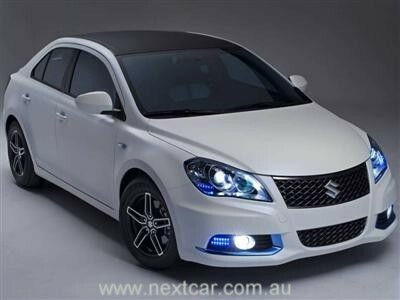 Suzuki America revealed two innovative and eye-catching new concept cars at last month's New York Motor Show – an environmentally-friendly Kizashi EcoCharge Concept and a high-performance Kizashi Apex Concept. The Kizashi EcoCharge Concept points to the company’s efforts in eco-conscious motoring with a 2.0 litre four cylinder petrol engine working in tandem with an advanced electric propulsion system combining a liquid-cooled 15 kW motor with a 115-volt air-cooled lithium-ion battery. Matched to a six-speed automatic transmission, the hybrid sees a 25 per cent improvement on real-world fuel economy over its petrol Kizashi sibling. “The basis for the Kizashi EcoCharge Concept was to attain substantial gains in fuel economy without the traditional sacrifices in drivability. While delivering a substantial fuel-economy gain, the electric charge to the powertrain system has still retained the dynamic handling advantages that make the Kizashi a standout category performer,” said Steve Youman, director of automotive marketing and product planning for American Suzuki Motor Corporation. In addition to the hybrid system, Suzuki has employed numerous other fuel-conserving technologies including regenerative braking, an engine stop-start system, fuel cut-off during deceleration and low-rolling resistance tyres. From the outside, the Kizashi EcoCharge Concept distances itself from its production 'sibling' with specialised headlight treatment, LED fog light illumination across the front fascia, new-look lightweight alloy wheels and a unique luminescent white satin paint finish with subtle blue undertones. 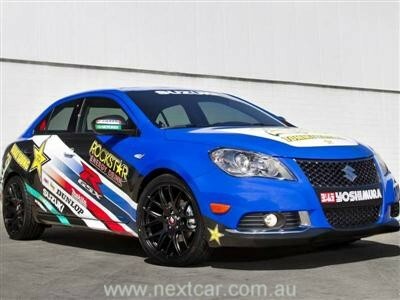 The Kizashi Apex Concept meanwhile is a salute to Suzuki’s legendary motor cycling heritage boasting a Garrett turbocharger, an air-to-liquid intercooler, electronic boost control and a specific engine control unit calibration for enhanced driving dynamics. Matched to a six-speed manual transmission, the force-fed system boosts peak output into the 210-220 kW range with maximum boost of 8.5 psi. “Our turbo-equipped concept leverages the exceptional Kizashi platform and infuses it with a substantial boost. The Kizashi Apex Concept will further elevate our flagship sedan amongst enthusiasts who crave added power and performance,” said Younan. Key to the Kizashi Apex Concept’s performance is its air-to-liquid intercooler which is designed for more effective charge air cooling in a smaller package. The unit’s relatively small heat exchanger and circulation pump are designed for minimal intrusions to vehicle cooling. The intercooler’s primary advantage comes from the reduction in the overall length of ducting which results in less turbo lag for a faster throttle response. The body’s striking livery is based on Suzuki’s motor cycle racing design theme and hints at the vehicles 'bloodline' to the legendary Suzuki GSX-R super bike. For a more dramatic front-end the lower fascia features customised LED-based fog lights while Yokohama S.Drive 245/35-R19 tyres offer advanced nanotechnology micro-fibre compounds to maximum traction in wet and dry conditions. HID headlamps and special light-weight 19 inch alloy wheels with a ‘burnt asphalt’ finish complete the high-level performance package. Inside, the cabin receives an eye-catching treatment in black leather with laser blue Alcantara® accents on the sports seats and steering wheel.